I reveal my Nanowrimo 2017 project and get an unexpected second bite at Ulysses. Today, I announced my Nanowrimo project for 2017 over on my Nanowrimo profile page. For the first time since 2014, I've decided to write a new novel. To make matters more interesting, I'm planning to write a romance (or at least a techno-thriller with a strong romantic plot). This is a first for me -- I know absolutely nothing about the genre -- which is both exhilarating and slightly terrifying. Also, I decided to mock up a cover using canva.com. Giving the novel a cover, even if only a mock up, makes it feel a little more real than an empty box on my Nanowrimo profile. I've created mock-up covers in the distant past (Nanowrimo 2009) but this is the first time I've used canva.com, a web app that lets you knock together a design using stock layouts and assets. For the purposes of a work-in-progress novel, it's more than adequate. 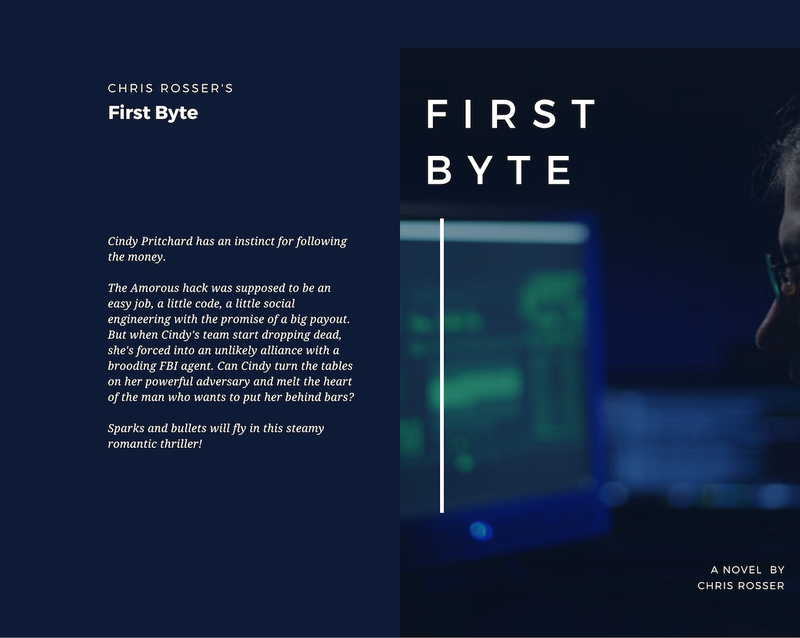 My working title is First Byte1; the mocked-up blurb and cover below. Committing to writing a new project means I really have to pull my finger out and finish the re-written draft of Weaver of Dreams. Nothing lights a fire under one's posterior like an actual deadline, rather than a self-imposed one. The good news is that my recent restructure has made my life somewhat easier. As I write this, the prologue and first four chapters are now with my alpha reader. Chapters 5 and 6 should follow within the next few days. For the next 27 days, my time's going to be divided between finishing Weaver and nutting out the plot of First Byte. Thanks to Nanowrimo, I've also scored a two-month trial of Ulysses giving me the proverbial second bite of the apple. If you've read my reviews of iA Writer and Ulysses (and my Text editor conundrum you'll appreciate when I say the timing is auspicious. I've been swaying between Ulysses and iA Writer for writing this blog. iA Writer is more practical, and cheaper, but Ulysses is more polished. This two-month trial of Ulysses will be more than enough to settle the matter. It also opens the possibility for using Ulysses to write Nanowrimo though in reality I'm more likely to use Scrivener. I dunno, lets see what happens.